an rv has been plugged into an outlet at my house. Would this greatly increase my power bill? Nobody was in the trailer using any appliances while it was there. 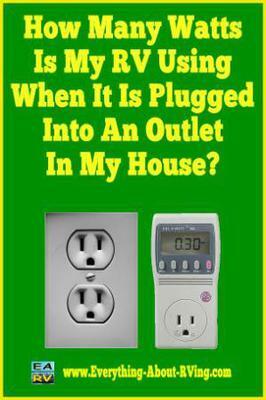 ANSWER I am unable to give you a direct answer on this question, but I do have a suggestion on how you can find out exactly how many watts your RV is drawing when it is plugged into an outlet in your home. You stated that no one was in the trailer using any of the appliances while it was plugged into your house. Well, some of your appliances may still be drawing electricity, even when they are "off". For example, some TVs, DVD players have standby modes that draw electricity even when off. I assume that your trailer also charges your house batteries when it is plugged into electric, that also draws watts. If your water heater can run on electric and it has not been shut off it can draw electricity. I don't really know that having your RV plugged into a home electrical outlet is going to cause a dramatic increase in your home's electrical usage, that being said there is one sure fire way of finding out. I would suggest that you invest about $25.00 and buy a product called the International P4400 Kill A Watt Electricity Usage Monitor (Pictured Above). This is a low-cost way of determining exactly how much electricity is being used by your RV. All you do is plug the Kill-A-Watt into the outlet you are going to use and then plug in the electric cord going to your RV into the outlet on the Kill-A-Watt. * Calculates electricity expenses by the day, week, month, or year. * Displays volts, amps, and wattage within 0.2 percent accuracy. This little device will definitely give you the answer you are looking for. I would also suggest that you use it in your house and plug some of your appliances into it. I believe you will be surprised on how many watts are being used by computers, humidifiers, air purifiers, TV cable box, refrigerator, hair dryers, etc. I hope I was able to answer your question in a round-about-way. If any of our visitors would like to add their opinions on this topic, they can click on the Click Here To Add Comments Link at the bottom of this page.